Now that I’m… older, I’ve grown to appreciate the fruit in many forms: broiled, margarita form, cookie form, and cake form. But let’s be honest – mostly in margarita form. An absolutely delicious way to use up half a grapefruit is to make grapefruit curd, a smooth, citrusy, and tart concoction that you can smear over angel food cake, toast, biscuits, or scones. It makes a great cake filling, too. Grapefruit juice alone isn’t acidic enough to thicken into the creamy deliciousness that you know as a citrus curd so you have to add a little lemon juice. A fact I discovered years ago before finding this recipe, after wasting 8 egg yolks and 2 sticks of butter in a mixture that just wouldn’t thicken. The color of your curd will depend on the color of your grapefruit. This batch was a very pale, orangey yellow. A previous batch was from a beautiful ruby Texas Rio Star grapefruit and it was a pinkish, salmon color. 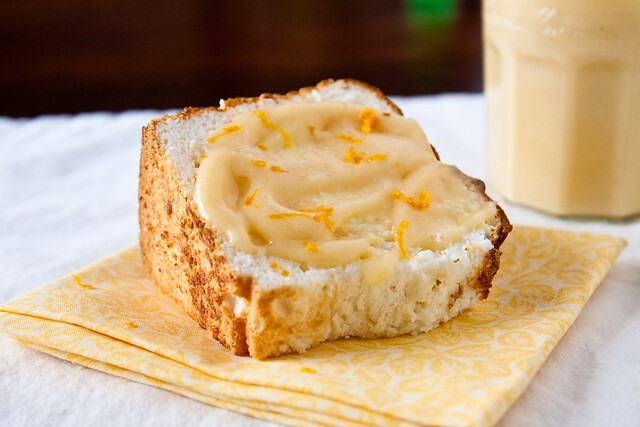 A smooth, citrusy, and tart concoction that you can smear over angel food cake, toast, or scones. Whisk the zest, juices, sugar, and eggs in a bowl set over a saucepan of simmering water. Add butter and whisk constantly, until thickened and smooth (a thermometer should read 160-170F). Strain curd through a fine sieve set over another bowl. Serve warm or cover surface of curd with wax paper and cool completely. Curd will keep a week in the fridge covered. I’ve made lemon and raspberry curd before but I’ve never thought about making it with grapefruit. I bet this would be delicious in a cake or a cupcake as well! I just wish the word ‘curd’ sounded as beautiful as this stuff tastes. Neat! Lemon and lime curd are the only flavours I’ve tried! This sounds lovely. This sounds wonderful. I love lemon curd and the grapefruit has such a nice tang to it. This is lovely. I am bored of having my toast with those strawberry or orange jam. This looks so beautiful with the zest sprinkled throughout. I’ve made grapefruit curd before but never could figure out what to really put it on – thanks for the good ideas! For some reason, the word curd has always bothered me. And for years, made me NOT want to eat anything called curd. Then, I wisened up and tried lemon curd and we’ve had a love affair ever since. I’m dying to try this recipe! If lemon curd tastes amazing, this has to be just as good, if not better! And it’s a great spread for holiday treats. I’ll be testing this out for sure! I think this would be a really lovely gift. Thanks for sharing this, the lower acidity of grapefruit would have never occurred to me. I’m with Branny- “curd” is not a very appetizing word. I may have to get over it, though, and try this… spread. It’s looks delicious! I MUST try this with angel food cake! I have alwats loved grapefruit – does that make me an old soul? I fell in love with grapefruit at an oldER age also…and now I’m smitten. Plus i love just about anything in curd form! Oooh- this looks glorious. 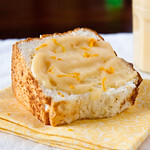 What a great way to use up the tasty citrus fruit this time of year. Can’t wait to try this! Thank you so much for this recipe! I made it yesterday and it is GORGEOUS. Made a few changes by using 3 eggs and upped the sugar to 1/2 cup and salt to 1/4 tsp. This stuff is delicious on an angel food cake (as pictured) or even straight out of the bowl. I made the mistake of cooking a little too long (wanted to make sure it was thick enough), and it started cooking out the egg. But running it through a fine mesh strainer took care of the little egg pieces and it was still to-die-for delicious. Hello! I’ve made this recipe a couple times now and it’s delicious and a family favourite. My only recommendation is to use unsalted butter. I made that mistake once and it was off-putting. Thanks again!